Hastur finally gets blessed with Invulnerability. The hefty cost can be reduced substantially with the loonies on both sides of the board. Give me a deck that can play Hastur 1-2 turns earlier, and I'll beat 9 times out of 10 an opposing deck that optimizes Hastur's terror ability with A Scheme of Byakhees, etc. Hastur is a bomb - I don't need to help him once he goes off. I just need to help him go off. 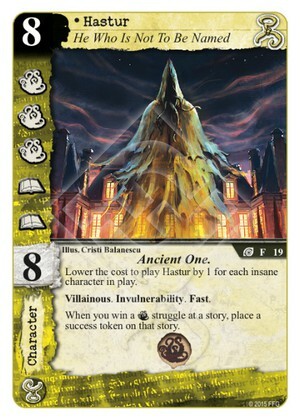 I think people fall in love - for good reason - with Hastur's terror ability, but we can easily forget that his printed cost is 8. I think that his cost-lowering ability is the ability that should be optimized - his terror ability will mostly take care of itself once he's on the table. So while my opponent is playing A Scheme of Byakhees in order to combo with a Hastur that he's still waiting to play, I've already played my own copy of Hastur and won myself another story. By playing Hastur just one turn earlier, that's likely 5 success tokens for me (3 on offense, 2 on defense), maybe more. There are 47 other cards in my deck that need help more than an already-played Hastur. Helping to play Hastur sooner? Absolutely. Helping Hastur be more effective once he's already played? Not so much. A little bit, but not much. Hastur is a 1-card combo, a game-ender. If he can't be that for my deck, then he's way too expensive to be in my deck.